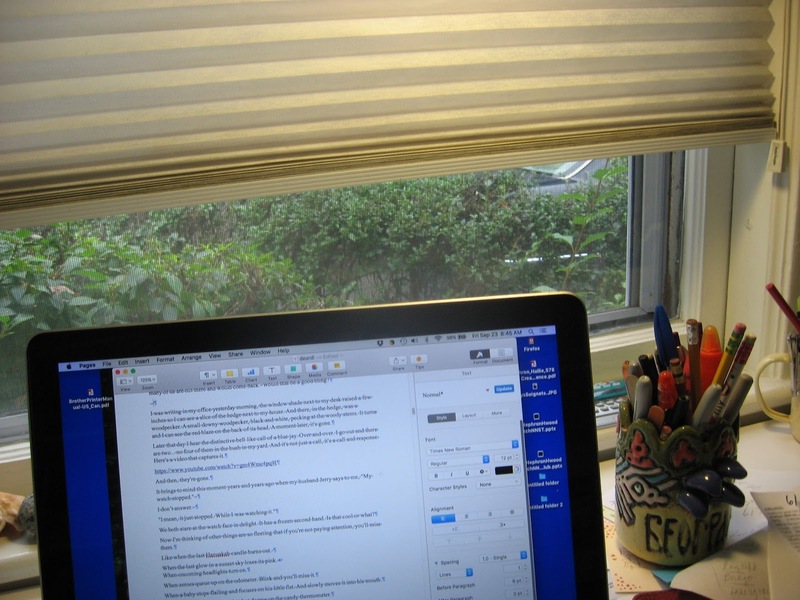 HALLIE EPHRON: I was writing in my office yesterday morning, the window shade next to my desk raised a few inches so I can see a slice of the hedge next to my house. And there, in the branches, was a downy woodpecker, a little black and white guy, pecking at the woody stems. It turns and I can see the red blaze on the back of its head. I go for my camera but when I come back to take this picture, the bird is gone. Later that day I hear the distinctive bell-like call of a blue jay. Over and over. I go out into the yard and there are two... no four of them in a bush. And it's not just a call. It's a call and response and choreographed head movements. They've a virtual synchronized swim team. This YouTube (thanks LesleytheBirdNerd) video captures it. This brings to mind this moment years and years ago when my husband Jerry says to me, "My watch stopped." "Need to get a new battery," I say. "I mean, it just stopped. While I was watching it." We both stare at the watch face in delight. It has a frozen second hand. Is that cool or what? Now I'm thinking of other things are so fleeting that if you're not paying attention, you'll miss them. When the last Hanukah candle burns out. When the clouds in a sunset sky lose their pink glow. When oncoming headlights turn on. When zeroes queue up on the odometer. When a baby stops flailing and focuses on his little fist. And slowly moves it into his mouth. When the temperature rises that last degree on the candy thermometer. When jello jells, an egg hatches, labor starts. And why does before something happens seems interminable, whereas the time after passes us by, unawares? What have you noticed lately that, if you hadn't been paying attention, you'd have missed? Hallie, what a treat to have a woodpecker and blue jays visiting your yard. Lately all we’ve had around here is a small army of marauding turkeys prancing through on their way to who knows where . . . . Lately, I’ve been noticing the flower buds in the garden just as they start to open; the lily I parked in the corner of the front porch after Easter has inexplicably developed a new flower and now I’m watching over it so that I don’t miss it’s blooming day . . . . I was on a run one day and I saw the grass moving oddly. Like something was walking under it. I stepped closer and it was a tiny gopher tortoise, no bigger than two or three inches long, making its way somewhere. Since I run the roads in our tiny HOA I don't have a phone with me. It would have been a fabulous picture. Hallie, I hope your downy comes back to visit! Beautiful observations, Hallie. At this time of year, it can be blazing hot when the sun is up (like yesterday here in northern Virginia, hitting 90), and as soon as the sun sets the air has that moment of cooling. You can almost smell it. Also - life itself. I lost someone dear to me in a moment on Wednesday, a nephew I'd know all of his 43 years. I''m flying to Wyoming in a couple of days to be with family and the hundreds who loved him, but why didn't I go while he was alive? That moment that changes everything. Lovely Hallie! Love Jerry's story about the watch. Edith, you hit the nail on the head on the most poignant change of all. So very sorry for your loss. We have a thicket of lovely zinnias in our garden now, along with peppers that are too hot, and a few other end of season veggies. The bees and butterflies are going crazy with our flowers, so I went out the other day to sit there and try to capture a photo of a butterfly landing. They didn't cooperate, so I sat and watched, noticing the flowers they chose to land on. Joan - another lily blossom? Now? That's magical. Kait - I had to look up gopher tortoise. Ten I had to imagine a tiny one. Like an animal action figure. Edith, my heart goes out to you and your family. So tragic. And you know, I had death on my list... because that moment between life and death is just that, a moment. It can be a gift to be able to be there and witness it for someone you love. Painful but at least afterward you can wrap your head around it. Having it ambush you like that? I can only imagine what you're going through. We've had SO MANY birds this fall. Downy woodpeckers and flickers (big woodpeckers) and nuthatches and cardinals and blue jays and mourning doves and flocks and flocks of sparrows. We have a bird bath and I've kept it topped off -- an we're having a drought. Fortunately no turkeys though our town is full of them. They're nasty. Oh, I looked outside and saw two robins going NUTS in the bird bath, plopping in and jumping sounds and having a great old time They are also taking turns--one would go in, splash, shake it off, and hop out. Then the other would have a turn. It was adorable, and they were so happy! I went to get my phone but they were gone. I awaited around, in writing time! but feeling like NATGEO, to catch them again, but bath time was over. Joan, isn't it amazing how a little , um, neglect :-) --doesn't matter? When they're ready, they're ready. : Love that! And I can never get enough of looking at our garden. Hallie, a beautiful post this morning. And Edith, so sorry for your loss--glad you will be able to be with family and friends. Sounds, too--taking a walk, my mind filled with useless worries and thoughts, somewhere unseen, a rooster crows and in that moment, I'm transported back to the magic of childhood on my grandparents' farm, an early riser like my grandmother--just the two of us watching the sun slowly make its way over the hills and into the valley--the coolness to the air--the hounds drowsing on the porch beneath the rocking chairs. Edith, once again let me offer my condolences for your nephew. I was up so early most of the days at Bouchercon, I saw the sun rise. that warmish glow, turning to gold, orange and finally the sun burst over the horizon. It almost made me determined to watch the sunrise every day. Thank you, Roberta and Hallie and Hank. Christopher was a real shining star, a caring ER nurse practitioner, funny and playful, a devoted husband and adoring father, and handsome with a thousand-watt smile, to boot. Ambushed is exactly what it feels like. I wake up every day and realize it wasn't just a bad dream. You're right about watching the moment, Hallie. I was privileged to sit with my two sisters with our mom as she died in 2012. It was an honor. FChurch - that paints the most beautiful picture for me... sounds and sense. Mary - that's a silver lining of traveling out your my time zone (or just being unable to sleep in an alien bed). Waking up before the sun. Yes, that moment when life leaves a human body. It took my breath away, and forever changed my mind about death and what it means to leave life, when I watched my grandmother die. I was concentrating on her, which wasn't easy with my mother and aunts wailing at her to "stay", and caught the exact moment when she gave it up. I'll forever be grateful to her for that final act of unconditional love. With all the daily distractions of the constant barrage of electronic communication (as I type this on a computer, over the Internet), it's too easy to get distracted. Filtering it all out so we can concentrate of the small, exquisite details is so important. Hallie, I love the video clip! I'm so bad at bird calls, despite 38 years with a bird photographer, that I did not realize that was a blue jay call. You learn something every day--if you pay attention! A poignant post. Edith, so very sorry for your loss. I wonder if one of the reasons we love reading and writing so much is because those moments are captured and we are made to see and smell and touch and experience what is on the page. We come back to "real" life with a sharper eye for details. I have been honored recently to be part of two very new lives, two granddaughters -- one is 6 1/2 months and the other is 3 1/2 weeks -- those moments are coming at me and slipping by in nanoseconds. I didn't see the older one for six days and now she sits up! I have never been so happy. I wish I could express it all as well as you, Hallie! Karen, I hear you. And btw bluejays make a whole bunch of different sounds, always noisy. Susan, that's really insightful - and I'm quite sure you're right. Writing is a way of collecting something that's otherwise evanescent by getting it down on paper. I've been privileged to attend many deaths, transformative moments equaled only by births. Do you know that when a child is first born, it seems all in attendance hold their breath. Then there is a wail and a gasp is heard all through the room. This only fails to happen when baby can't take that first breath without help, with resuscitation needed. Denise Ann, as a recent grandmother (one 3 years, one 6 months) I KNOW JUST WHAT YOU MEAN! Yesterday our little one recognized himself in the mirror, shrieked with delight, and my daughter captured it on video and sent it to me. Another way to capture moments (good and bad). Ann, you're reminding me of when my first baby was born and we waited... and waited for that first cry. Finally! Longest wait of my life. Birth, of course! Back in my childbirth instructor/doula days, I attended a number of babies' first moments, as well as the birth of my best friend's daughter, born at home 31 years ago. Such a miracle and a gift. I've really loved putting some of those moments into my Quaker midwife's life. Thank you all for your support. It means a lot, and I did NOT mean to hijack the thread. This was a beautiful post, Hallie. So true. And Edith, my very best wishes to you. As we get older and lose friends I'm very aware of all that is fleeting and impermanent. We live on a hill and I and I am constantly aware of clouds, fog coming over the mountain, flight of birds or a plane crossing the sky at night. Sometimes I sit on my balcony in the dark and just watch the night. Oh--I saw my grandson ELi realize he could read. He was sitting on our family room couch, and I had given him a book he'd never seen before. He opened it, all skeptical, and I said --read it out loud. And he began, and then--stopped. In awe. He looked at me, eyes wide. And then went on. Hallie, what a lovely post. And Hank, that's magical. I hope I get to see that with my granddaughter one day. Edith, I'm so sorry for your loss. My husband lost his father that way, when he was nine. My heart goes out to your nephew's family. And to you. I'm always watching our birds, particularly the hummingbirds. Every time I see one at the feeder or zooming through the flowers, I wonder if it will be the last one I see until March. But you can't know until they're gone, so every sighting is special. I was carrying in groceries the other day and for some reason looked down at the driveway. I had almost put my foot on a huge dragonfly. I think it had just died because its body was still soft and its wings undamaged. I scooped it up on a piece of paper and brought it inside, thinking I might draw it. Another way of capturing those moments. In the last couple of years I've watched my mother take her last breath and my granddaughter take her first. Both joyous and incredibly privileged moments. This piece speaks to me. And has brought some memories to mind that I came close to missing. And, honestly, a few I wish I had. One thing I must say, my camera has helped me notice things that I might not have without it. Even if I don't take the picture, I have captured it. That moment when your car odometer turns over a significant digit. You look for it for miles, but then, more often than not, miss it in the moment. It's not about the number, it's about the miles traveled, the places visited, the conversations with family that have taken place along the way. I flew from Portland to Denver yesterday, and as we were crossing over a perfectly cloudless Nebraska, I was resting my head near the window. I realized there was a faint, bright wash traveling across the landscape that was the reflection of sunlight off the jet! I had never noticed that before, and I was enchanted. Julia, and sometimes the sun is just right in the sky so that water on the ground lights up gold as you pass over it. Barb, and slowing down enough to savor the moments. Kaye, YES, picture taking expands what you actually see! A friend/photographer just did a series of pictures, all of them reflections in windows, water, glass... and they're just the kinds of 'landscapes' that are so easy to miss. Oh, Hallie, I love noticing those fleeting changes or appearances, and for the first time in a long time, I saw a blue jay in my backyard today. One year, I had a leaf on our big tree out front that was hanging on long after the other leaves had gone in the fall. I noticed that leaf every day until it finally fell. There is so much of the extraordinary in the ordinary. Edith, I have been thinking about you and your sister and your nephew's family. So many people affected by this tragic loss. I continue to keep you all in my thoughts and prayers. Edith, our thoughts and prayers are with you and your family.